The radio station's Dale Duff said he believes the Red Sox are the most popular of the three teams “and I think that would be the case in Boston proper and metro, too.”. Maine news, sports, politics, election results, and obituaries from the Bangor Daily News. The Boston Red Sox will get top priority if there are scheduling conflicts with other Boston sports teams on 92.9-FM The Ticket (WEZQ) according to Dale Duff, brand manager for the Townsquare Media station. The station also carries Boston Bruins, Boston Celtics and New England Patriots games and the Bruins and the Celtics are currently in the first round of their respective playoffs. The National Hockey League Bruins took a 2-0 lead in their best-of-seven Stanley Cup Eastern Conference quarterfinal series with the Toronto Maple Leafs entering a Monday night game in Toronto. The Celtics will take a 1-0 series edge into the second game of their best-of-seven National Basketball Association Eastern Conference quarterfinal series with the Milwaukee Bucks on Tuesday night. “In the early going, we’re going with the Red Sox because they’re new to us, we just got the contract and all of that,” explained Duff. The Ticket announced a three-year agreement with the Red Sox in January. The Red Sox had been on WZON The Pulse (620 AM) since 1994. He also noted that the fact the Red Sox’s 13-2 start is the best in the franchise’s 118-year history enhances the interest in the Red Sox. If the teams play at different times on the same day and there is a sizeable gap, The Ticket will air both games. For example, the Red Sox played an afternoon game against Baltimore on Saturday and the Bruins played the Maple Leafs on Saturday night in Game Two. But there has to be a significant stretch of time between the games, he stated. For example, on Tuesday night, the Celtics and Bucks will play at 8 and the Red Sox will take on the Los Angeles Angels at 10. He went on to explain that the Celtics were a hot commodity when they were rattling off their 16-game winning streak in October and November so they would get the nod over the Bruins. During the playoffs, he pointed out that it can depend on the series standing. A team in a potential series-clinching game would have an edge over the other team if that team was in the fifth game of a series that was tied 2-2. Complicating their scheduling decisions is the fact that game times have yet to be released by the NHL and NBA for games five, six and seven in those series because they revolve around television coverage. They like to make a decision at least a couple of days before a game so they can promote the broadcast but sometimes it’s not possible. “We try to be as flexible as possible,” said Duff. Eric VanDenBossche has spent the last three months co-hosting The Morning Pitch with Duff Duff from 6-8 a.m. on The Ticket 92.9 after replacing Bryan Stackpole. Stackpole said he decided to leave for a variety of reasons including an opportunity to pursue a marketing and promotions opportunity at Season’s Grille and Sports Lounge. The 34-year-old VanDenBossche grew up in Livermore Falls and Gardiner and is a 2006 graduate of the New England School of Communications on the Husson University in Bangor. In addition to his Morning Pitch gig, he also handled play-by-play and color analyst chores for the high school basketball tournament and will do baseball and softball games this spring for the station. 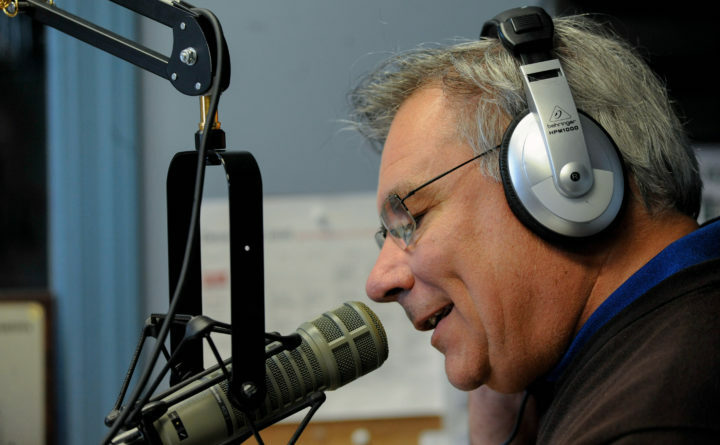 Prior to coming to The Ticket, he was a news anchor at radio stations in Maine and Ohio and a disc jockey for country music station Q 106.5-FM, which is another Townsquare Media station located in the same building as The Ticket in Brewer. “He works hard and that’s all you can ask for,” said Duff. Several minutes of Saturday’s University of Maine’s softball doubleheader against the University of Maryland Baltimore County on WGUY AM 1230 was marred by the station’s oldies music format airing during the actual play-by-play.